We now know that this was actually Henry Kara Danvers. Clark: "I would love to play Superman on the new Supergirl show!" Kara: "You have to wear the costume and cape." Clark: "Oh, then forget it." Laura: "Tom, I can't believe they didn't call me to do a cameo on the new 'Supergirl' show. You woul think that after playing Kara for three years on 'Smallville', I'd at least rate a guest shot. You were Clark on 'Smallville' for ten years. What do you think?" Tom: "Huh? 'Smallville'? Never heard of it." Kara: This feels weird. It feels familiar. 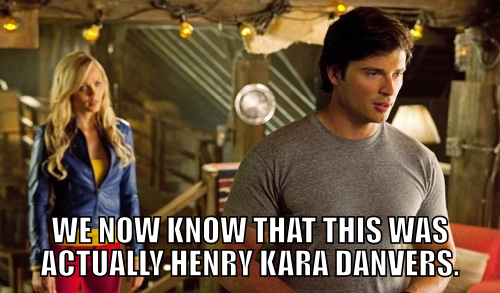 Clark: I know...we haven't done a Smallville caption for ages! "Laura, it's the pants. Guys just don't dig the pants!" So, now you know! The real reason I don't want to wear the costume is that I can't stand the sight of red, yellow and blue together! Clark: "When I was young, it took a super-hero TEN YEARS to put on their costume and fly!"